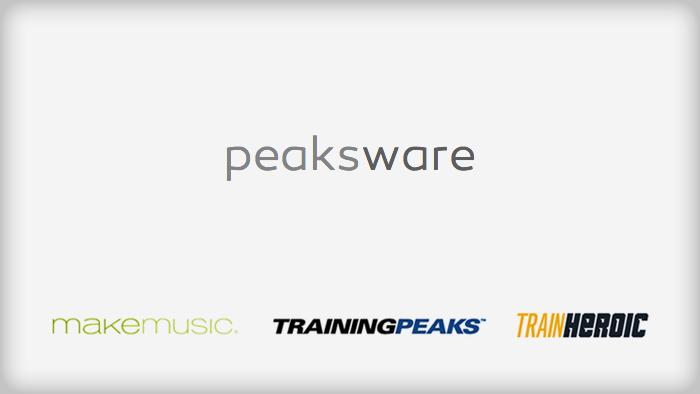 If you are an astute observer, you’ll know that TrainingPeaks has long had the corporate entity, “Peaksware, Inc” behind it. Some time ago Andy Stephens, the Chairman of our board approached us with the challenge of building and managing a larger organization with a big, long-term strategy. This strategy is the opportunity to leverage significant capital to invest in other software platforms, reach different markets and build a high performance organization. While growing the umbrella corporation of Peaksware, each product and team will remain completely authentic to their domain. Yesterday we announced a major step toward the realization of this broader corporate vision. MakeMusic, a company dedicated to transforming how music is composed, taught, learned and performed will officially join Peaksware. This announcement marks an initial phase in our overall vision to bring together multiple brands aligned around our common strategy of deliberate practice. In addition to MakeMusic, we have also recently invested in, and relocated a great team of entrepreneurs that have built Train Heroic, a software platform that solves the needs of strength and conditioning coaches and teams to help them “win in the gym”. You can read the press release to get more background. As you can see, we’ve been busy! To allow myself, Dirk and the rest of the Peaksware executive team to take on this larger challenge, the phenomenal group of employees at TrainingPeaks have stepped up to ensure we don’t miss a beat with continuing to build and evolve innovative products for our TrainingPeaks customers. TrainingPeaks and our focus on meeting the needs of the cycling, triathlon and running coach and athlete has not, and will not change. We’re not going anywhere, and with renewed vigor, we’re growing. In fact, we recently announced that Ben Pryhoda has been promoted to Chief Product Officer, and he now officially leads the TrainingPeaks roadmap. The reality is, he’s been driving it for quite some time. As a long time endurance athlete and TrainingPeaks employee for 6+ years, Ben is well suited to the job. So, although we’re focusing on our new challenge of realizing the larger Peaksware vision, TrainingPeaks is in good hands. Ultimately, we believe that through this vision, we can help countless more people to learn a skill, and we’re bringing together software platforms to help guide people along their own journey of improvement. Whether that’s an endurance athlete looking to complete a marathon, or a student trying to learn the clarinet, the same principles apply. 1) Set a specific goal, 2) get expert instruction, 3) perform focused practice and adapt to the 4) immediate feedback received. This shared approach is the common thread connecting our brands under the Peaksware umbrella. While there are many big challenges ahead, we feel particularly grateful that we have such a strong team at TrainingPeaks that will stay steadfastly focused on the endurance community. Likewise, as we work to bring MakeMusic into the fold, their dedicated employees and world-class products will stay completely focused as industry leading tools for music, and for the music education industry.